The steering control rods need to clear the chain. This is most evident on a recumbent as the chain is often routed past the steering system and can lead to chain inefficiency and complication of the drive chain routing. The handlebar controls need to move the expected way. Pull the left bar to go left etc This seems obvious but has been overlooked before and rules out several design I first drew up. Click here to download a spreadsheet specific to direct handlebars on the kingpins, Additionally to this I would say.... You could also go to Peter Eland's Ackermann steering design Spreadsheet program Web page for this and many more. The more joints the more chance of slop in the steering. Try to allow for wheel alignment toe-in toe-out adjustment. Many of these designs can be used for rear wheel steering by reversing the drawing. See this Trike. Here's a 5 second video showing the steering movement. 475k, MPEG format, viewing size 320 x 200. This design would have some problem with bump steer. When the wheels contact a rough surface the axle would tend jerk around and be hard to control. An example of this design is the S-327. Also have a look at the Trice made by Ross. See this picture for an example of this design. It may not be so suitable for trikes going at too greater speed (over 60 KPH) but has been quite functional on all the trikes I've made and is quite simple to build. This can be seen on the Windcheetah (sometimes called Speedie). This is seen on the Greenspeed trikes. For a description of a lean steer project take a look at these Web pages produced by F.Bokhorst. For a example have a look at the Web pages by Samuel Quadflieg, also the Mountain Quad & ICE trikes. This would not give much steering movement but is functional. This is like on the Jouta VX. This idea designed for a SWB bike but there's no reason why it can't also be used on a trike. The control chain is tensioned on both sides in a way that makes the handlebars straight and also give slop free movement. The idea is to use bike chain to connect the handlebars to the forks. A tube is welded to the top of each fork crown so that bolt can pass through it. 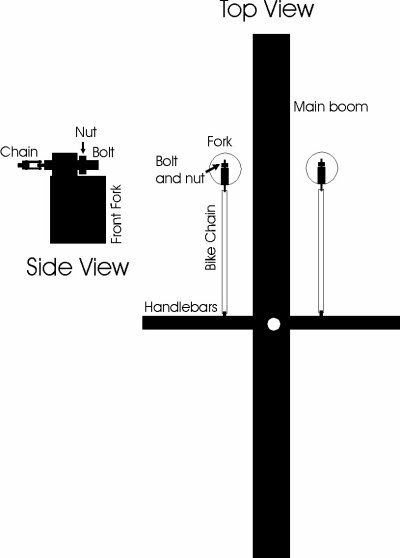 The bolt is used to tension the closed loop system. The end of the bolt is flattened out, a hole drilled into the end so that the chain can be clamped on as they usually are, using the chain pins. On the handlebar side either a lug is welded onto the bars or a metal strap wrapped around the bars with the chain clamping to it using it's own pins. This can be seen on the Luke Breen's (owner of Calhoun Cycles) fixed gear recumbent kids trike. This is shown as Rear wheel steering. Also check out USA patent 4799704 for another version similar to this. The Joystick pivots in the middle and both are connected with a rod below the pivot so they move together. Check out this USA patent 5069469 of the HPE Corsa Trike. - Another pic. 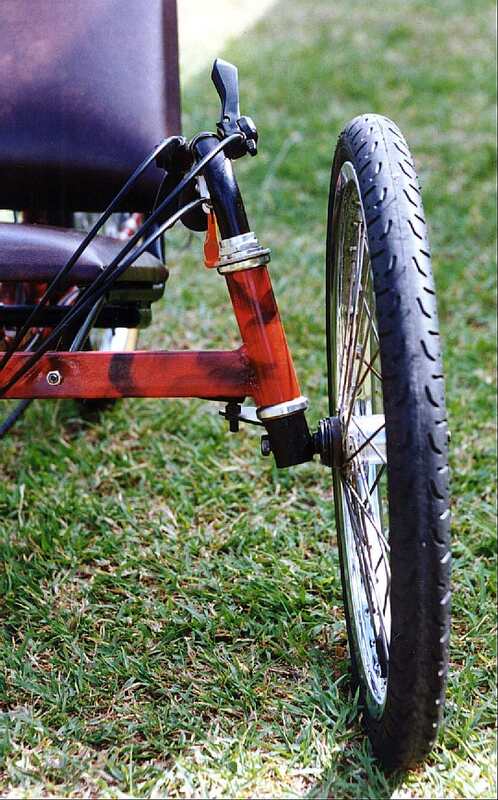 A Rear Wheel Lean Steer trike with front wheel drive. This is probably the Patent for the Tricumbent Raven and has just been aquired by Just 2 bikes.